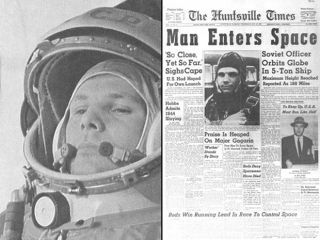 It was 53 years ago today on April 12, 1961 when cosmonaut Yuri Gagarin launched into space aboard his Soviet Vostok 1 and ushered in an era of space travel that continues to this today. Twenty years aftet Gagarin's flight, NASA's first space shuttle flight soared on its maiden flight with John Young and Robert Crippen aboard the Columbia, and the age of winged spaceflight was born. "The efforts put forward by our fans and by many events to host bigger and better parties each year is great!” Yuri's Night executive director Ryan Kobrick said in a statement. "We're nearly at 200 events, and we expect to register many more by Saturday. This is going to be another fantastic year for Yuri's Night." To find a Yuri's Night event near you, visit: http://find.yurisnight.net.